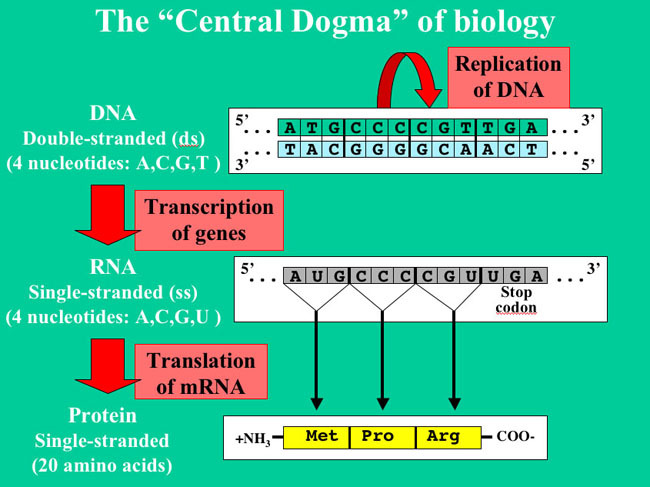 Biology's "Central Dogma" -The secret of life! Figure by Bruce Fouke (2006). Transcription of DNA to RNA to protein: This "Central Dogma" forms the backbone of molecular biology and is represented by three major stages. The DNA is copied thereby replicating its information in a process that involves many enzymes. This process is calledreplication . The DNA codes for the production of messenger RNA (mRNA) during transcription. Messenger RNA carries coded information to ribosomes. The ribosomes "read" this information and use it for protein synthesis. This process is calledtranslation . Proteins do not code for the production of protein, RNA or DNA. They are involved in almost all biological activities, structural or enzymatic. DNA/RNA - What is it good for? Deoxyribonucleic acid (DNA) is a nucleic acid -usually in the form of a double helix- that contains the genetic instructions specifying the biological development of all cellular forms of life and most viruses. DNA is a long polymer of nucleotides and encodes the sequence of the amino acid residues in proteins using the genetic code, a triplet code of nucleotides(from Wikipedia ). Contrary to a common misconception, DNA is not a single molecule, but rather a pair of molecules joined by hydrogen bonds; it is organized as two complementary strands, head-to-toe, with the hydrogen bonds between them. Each strand of DNA is a chain of chemical "building blocks" called nucleotides, of which there are four types: adenine (abbreviated A), cytosine (C), guanine (G) and thymine (T). Between the two strands, each base can only "pair up" with one single predetermined other base: A+T, T+A, C+G and G+C are the only possible combinations; that is, an "A" on one strand of double-stranded DNA will "mate" properly only with a "T" on the other, complementary strand. Therefore, naming the bases on the conventionally chosen side of the strand is enough to describe the entire double-strand sequence. Two nucleotides paired together are called a base pair. The following resources were originally accessed through the BioSciEd Net (BEN) digital resources collection, which is the National Science Digital Library (NSDL) (more info) Pathway for biological sciences education. For more teaching resources, please visit BEN to use their searchable database. BEN is free to use, but requires registration. DNA Molecule- Two Views - this AccessExcellence resource offers an image and description of the DNA molecule. DNA Structure - this MicrobeLibrary.org resource offers several images of DNA structures. Atlas of Macromolecules - this website offers pictures and lesson plans regarding major macromolecules such as proteins, DNA, and RNA.